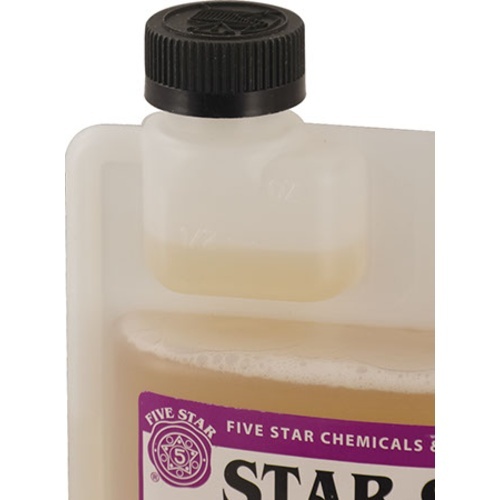 Star San is an acid based sanitizer that is quick, odorless, tasteless and safe for most materials except softer metals. Use of 1 oz of Star San per 5 gallons of water and a contact time of 1 minute makes Star San very economical and convenient. As a high foamer, Star San's foaming action insures coverage and contact time in larger vessels and better penetration into nooks and crannys. Any foam that is left over in your carboy or keg from the Star San solution will not harm your beer or you, and is perfectly safe and non-toxic, nor will it impart any flavors or odors. If you plan on making some up for spray application it is best to use distilled or RO water to maximize the life of the unused portion (minerals in tap water reduce the shelf life of Star San once in solution). If a lower foaming alternative is preferred, for bottling or multiple batches, check out Saniclean. I've used only this sanitizer for multiple batches of beer and wine. Every batch has been great- I love how easy it is to use, no rinse needed. I fill a spray bottle with some of it to continually re-sanitize as needed. Add it to the water at end to minimize foam. StarSan is fantastic. I typically use the low foam version but the regular formula is great too. Very easy to use and works great. Has a nice clean smell. I put this stuff on everything! The best sanitizer hands down. I use RO water when mixing my give gallon batches up to extend the life of it. No taste, no rinse, no problems! What more could you ask for? Do not worry about the foam. The foam is your friend. Years of use without an infection. Used this for sanitizing everything but I found a new use last time I was preparing my bottles. I use Oxi***** for removing labels but it would take forever to get the slippery residue off with just water. I tried to simplify the process and placed a tub of StarSan next to the Oxi*****. Well a 1-2 second dunk and the bottles are squeaky! This is the best, easiest and my personal fav. Best sanitizer available! I think the best part is that in certain concentrations it also acts as a yeast nutrient! Very good price for the amount you get. Star San is the best sanitizer out there. It's a great no-rinse sanitizer that comes with its own built-in measuring device. Love it! Love me some star san! Best sanitizing agent on the market! And I LOVE the way this bottle makes it easy to pour 1 OZ pours!!! Pretty straight forward. It's a great sanitizer with a short contact time and won't harm your beer if you leave a little bit in a fermenter. Just to be clear this is a sanitizer not a cleaner.... I made that mistake and the resulting beer was less than desirable. This stuff works great! I recommend buying a good chemical resistant spray bottle and spraying everything instead of filling and soaking. All you need is the starsans to cover the surfaces. No need to waste all that fine product by filling all the empty space between the surfaces. This in combination with the carboy/keg washer is great. makes sanitizing so easy even I can do it after more than a few homebrews! A must have for every brewer! I have had great experiences using this product to sanitize my SS conical. 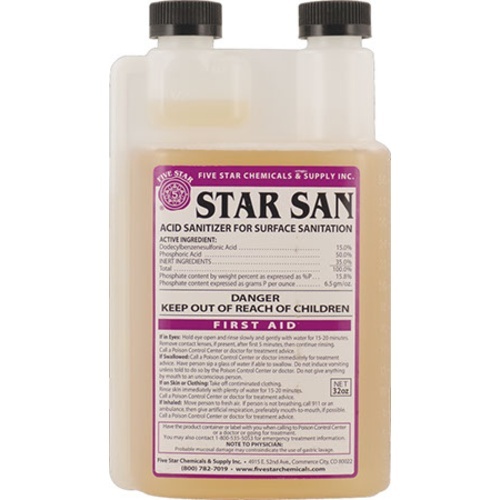 First couple years I would use Iodophor, but did some research and found out that Star San was a much better sanitizer. It really is the best...don't fear the foam! StarSan is incredibly easy to use and lasts a long time. As long as it is covered, this sanitizer can be reused. A very short contact time is sufficient to sanitize any clean surface. I keep some in a spray bottle as well for parts that are difficult to immerse. I use this to sanitize all of my equipment and have never experienced an infected batch of beer. Highly recommended. Don't fear the foam! This stuff is the best and lasts forever! What more can I say - it is non-staining, you do not have to rinse and a batch will last for a long time. Star San is a great sanitizer. Some people complain about the foaming. But it is the foam that will get into the nooks and crannies. To save money and keep the solution from turning milky white, use RO water. I buy 5 gallon bottle of water from my home brew store and mix it with the star san. After you are finished with your sanitation, just rack the star san back into the 5 gallon bottle and store with the lid on. You can continually use it as long as the pH is below 3. A real staple for serious brewers and great for keeping your beer untarnished. A little goes a long way. Love the built in measuring cup on the bottle. The foam hasn't caused me any noticeable issues. I trust this stuff to sanitize all my brewing equipment. If it comes in contact with my beer, its soaked in a starsan solution for 5 minutes. The directions say less time is needed I think but I've never had any issues. Now just an FYI this is a sanitizer, not a cleaner. I didn't clean a bottle well enough in a batch one time, let the bottles sit for 4 days till I finally got back to them and I had a black mold growing inside. Check your PH levels, and as a general rule if it's gray, make new. It's cheap. My GO-TO sanitizer. I mix with distilled water and it lasts a very long time. Its much cheaper to buy here than at the LHBS where I mostly just buy my grain and hops. Always have on hand in a squirt bottle and use for all my lines / tubes / fermenters / etc. No off flavors, wonderful to be able to rack right on top of the foam. no need for any other sanitizer. Although I use it for beer and wine making, it is also very useful for canning. Instead of boiling jars and lids, I just dip them in this stuff. I used to run a sulfite solution through my pump and bottler before using. Now I use a solution of StarSan. Much friendlier. I've been using the stuff for a while now and let me say it last forever, it easy to use and has the biggest bang for your buck. there is no reason to buy anything else. This is a good value for StarSan. I have never had an infection problem while using this no-rinse sanitizer. StarSan works great. I keep about 25 gallons of sanitizer solution in a trash can to dunk my bottles into and I left a bunch of bottles in it over night and it removed the painted on labels that some breweries us, like Stone. So I wouldn't leave any in it too long. Have had no issues with sanitation since I've been using this product. Highly recommend. I've never had an infected batch using this. If you mix it with distilled water, then you can use it for multiple batches. Doing this will make this 32oz bottle last a looooong time! When I make a batch of starsan, I save it in my bottling bucket for later use. Use a pH tester strip or a digital pH meter to make sure it's still at a pH close to 1. I have some starsan used for soaking utensils that's still potent 6 months after making it. I use this for every batch. Before and after cleaning... does the job and no after taste. I even accidentally left some in my lines during transfer with no off flavors. I prefer old fashioned idofor, but that's just me. I use Star San for my sanitizing program. Five star products are effective an easy to use...I do not clean or sanitize with out them. This stuff is great I use it on everything. Super easy to use. Like most brewers, I love this product. I add 1.5 to 3 CCs to my 32 oz spray bottle filled with water and spray down inside of cleaned kegs and carboys as it only needs to contact the surface. I also spray down all surfaces where I brew, such as counters, etc. Makes the product go a long way! Star San is probably the most important thing you can buy for home brewing. All the hard work you put in will be for naught if you don't keep things sanitary. So easy to measure with the container designed the way it is, and with careful use I have never had a contaminated batch (when used in concert with PBW to clean first) use it to sanitize my bottles too before bottling. the best thing on the market in my opinion. Or likely THE MOST important thing, disinfecting is probably the most important part of making delicious beer and this stuff does exactly what its supposed to do, beer using it since i started brewing 8 years ago, and never lost a beer to contamination. Easy to mix and use. I keep some in a spray bottle while beer is fermenting, so I can spray my sample valve before and after taking a sample. I keep my unused kegs full of sanitizer as well. Come on...your beer is only as good as your cleaning routine. And Star San has never let me down. It's easy to mix up, lasts a while in a spray bottle and makes brew day stress free! This super, easy-to-use sanitizer gets my brewing equipment ready for the important brewing processes. I recommend adding the water first, then adding Star-San to minimize the amount of bubbles and foam. I use this product regularly for sanitizing my bottles, carboys, transfer tubes, and other bottling equipment. I've never had a sanitation issue when using Star-San. Great product. This is my first time using starsan. I have always used the powdered sanitizer and didn't have a problem but wanted to try the starsan to see if it is everything I have heard about. I will never go back to powdered again!! Great for brewing. Its also nice to save money by buying it in the larger quantities!